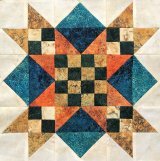 Welcome to Prairie Flower Quilt Co......Where fabric, friends and fun blossom! We are a full-service quilt shop offering 2500+ bolts of absolutely the most gorgeous fabric (is there any that isn't? ), cutest books and patterns, niftiest notions, and machine quilting services. Browse our site, shop 'til you drop; but even better, come visit us in person.